This small Grouping is devoted to the strategic aspects of World War Two. As a global war, fought simultaneously on several fronts it was necessary for the Allies to direct and husband resources; prioritize campaigns and undertake actions that often had hemispheric consequence. This was accomplished at high level conferences held at various locations during the war usually attended by U.S. President Franklin D. Roosevelt and British Prime Minister Winston Churchill and other allied leaders. The most notable conferences were those held at Casablanca, Quebec, Cairo, Tehran, Yalta and Potsdam. 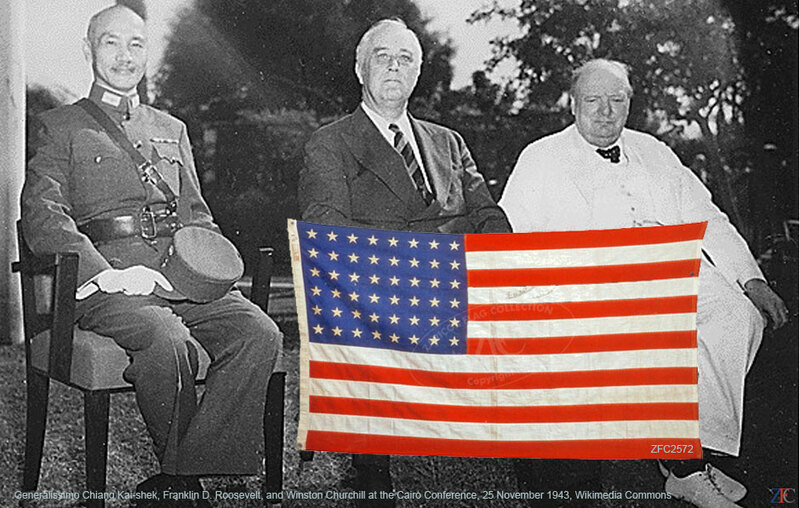 Included in this Grouping are two unique items: a U.S. flag autographed by both U.S. President Franklin D. Roosevelt and British Prime Minister Winston Churchill during the Cairo-Tehran Conferences in 1944. Concluding the strategic grouping are period Chinese and British flags.